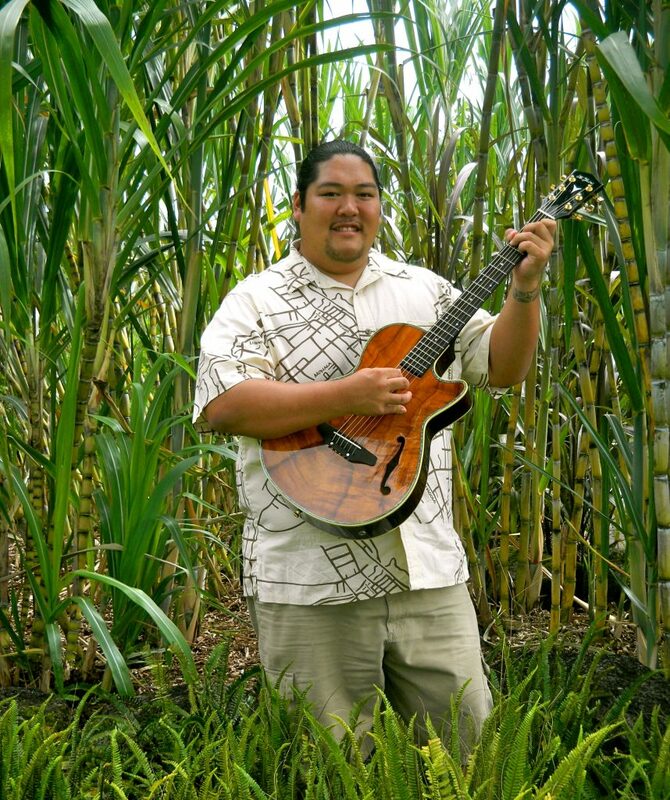 It’s a thought that makes diehard Hawaiian music fans of Mark Yamanaka count their blessings when they learn that the multiple Nä Hökü Hanohano-award winner once questioned whether, as a non-Hawaiian, he should be playing Hawaiian music. Fortunately, Mark’s mentor, a respected Hilo kumu hula (hula teacher), showed the budding musical talent that there was a place at the lü‘au table for him, regardless of whether Hawaiian blood flowed through his veins. If his heart loved Hawaiian music and culture, then Mark Yamanaka belonged. So how did the hapa boy of Japanese, Chinese and Filipino ethnicities become one of Hawai‘i’s most popular Hawaiian musical talents? It’s an unlikely story considering there were no musicians in his family. Interestingly, while a fourth-grader at Hilo Union School, Mark took a mandatory ‘ukulele class and found the instrument “difficult” and not very interesting. In time, however, Hawaiian music began to grow on young Mark. His parents and grandparents loved Hawaiian music — it was the only kind of music that flowed through the Yamanaka home. Family friends sometimes gathered in their garage for informal jam sessions that Mark grew to enjoy. But, it was Mark’s love for basketball that actually led to his picking up the ‘ukulele and learning to play Hawaiian music. It helped that all of his basketball friends at Hilo Intermediate School were from families who played Hawaiian music. Hearing them play Hawaiian songs brought him closer to the music he heard at home and sparked a desire to play that music himself. He asked his hoops buddies to teach him how to play the ‘ukulele. In his sophomore year at Hilo High School, he began teaching himself how to play the guitar by studying chord books. He also began mimicking falsetto singers. Mark and a few friends then formed a band, “Stat’em Up,” and began playing at weddings and other events around town. Late in his senior year, Mark’s friend and now fellow musician, Kuana Torres Kahele, introduced him to noted Hilo kumu hula Johnny Lum Ho. That introduction set Mark’s music education off on a serious track. Mark began spending long hours studying with Uncle Johnny and performing his music. He also became a musician for Lum Ho’s Hälau O Ka Ua Kani Lehua. Mark said he understands hula visually, but is not a dancer himself. To this day, Mark credits Johnny Lum Ho for his musical success. “I consider him my roots, where it all began,” he says. As Mark began to spread his musical wings, so grew his songbook. By the time he recorded his two CDs, “Lei Pua Kenikeni,” which won four Nä Hökü Hanohano awards in 2011, and “Lei Maile,” winner of five Nä Hökü Hanohano awards in 2014, his musical repertoire had grown to include Hawaiian mele (songs), as well as country songs, Christian hymns and even a 1973 Carpenters tune. Mark also writes his own compositions, although not in Hawaiian language. Some of his songs begin as English-language poems that describe feelings or personal experiences, which he has reinterpreted into Hawaiian. Others are written and recorded in English, including his romantic “Maui Under Moonlight,” which won the Hökü award for Single of the Year in 2014. While not a native speaker of Hawaiian language, he feels a responsibility to learn the language in order to understand what he is singing in Hawaiian. His daughter, who attends Ke Kula ‘O Näwahïokalani‘opu‘u, the Hawaiian medium charter school, speaks Hawaiian fluently and keeps her dad on his toes. Family is a recurring theme in Mark’s music. In his first CD, “Lei Pua Kenikeni,” he composed a poignant song that celebrates the birth of his daughter, “Kaleoonälani.” On that same album, he sings “Ka Mea Hana ‘Äpiki,” a song written by Kuana Torres Kahele that lovingly teases Mark’s son for his mischievous antics. When Mark’s paternal grandmother passed away in May, Mark wrote an original song for her memorial service, “Grandma’s Love,” and later presented a recording of it to his dad for Father’s Day. Perhaps the most unusual selection on his latest CD is “Danny Boy,” the early 20th century Irish ballad. Mark was asked to perform it at the Hilo memorial service for the late U.S. Sen. Daniel K. Inouye in December 2012. Actually, he had been asked to sing two of Sen. Inouye’s favorite songs — “Kaimana Hila” and “Danny Boy.” He knew “Kaimana Hila,” but had never heard of “Danny Boy.” Almost overnight, Mark learned the classic ballad from his girlfriend’s grandfather, steel guitarist Dwight Tokumoto. Mark fell in love with the haunting melody and decided to record it. He said that “Danny Boy” is one of the most requested songs whenever he performs in Japan or to groups of 442nd Regimental Combat Team veterans in Hawai‘i. As diverse as his recording selections are Mark’s performance venues. He performs about a hundred concerts a year and is as happy to delight a 17-year-old fan by playing at her high school graduation party as he is to jump on a plane and do a show in Las Vegas or California. Mark prefers to book his own performances. When at home in Hilo on weekends, he can be found playing any number of gigs — for local business groups, private parties, at public venues like the Palace Theatre or even “under the stars” at the ‘Imiloa Astronomy Center planetarium. And even with nine coveted Nä Hökü Hanohano awards under his belt, he said he still gets stage fright when it’s time to perform. Mark has developed a large fan base in Japan and has been traveling there to perform since 2000. He averages six trips a year to Japan alone — one year, he made nine trips for performances. One trip was especially memorable because he was able to connect with some relatives from Mie Prefecture, where his Yamanaka ‘ohana traces its roots. 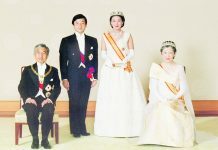 The two families had lost touch with each other some two decades earlier. At one of his concerts, Mark arranged a backstage reunion between his dad and those relatives who had come to see him perform. “I have not performed there (Mie Prefecture) as of yet, but I hope to one day soon,” Mark said. As busy as he is musically, he also manages to hold down a day job. 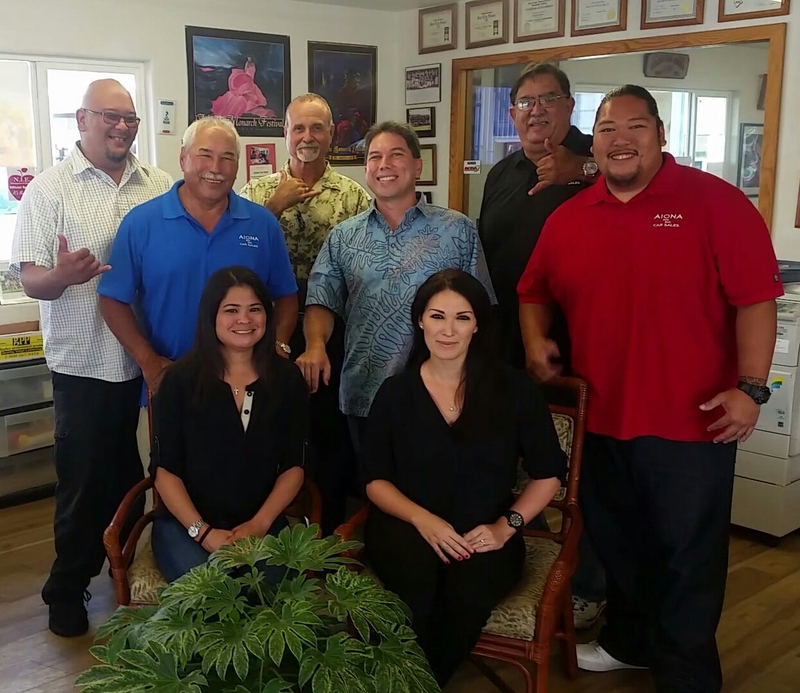 Since 2007, Mark has been a member of the sales team of the family-owned Aiona Car Sales in Hilo. Mark describes the Aionas as “lifelong friends . . . since ‘hanabata days.’” Mark services Aiona customers when he’s in town, but takes off with the blessing of his boss, Patrick Aiona Sr., when concert tours beckon. One can only imagine the top quality entertainment that the Aiona Car Sales staff enjoys at their holiday parties! So, what’s next for the 35-year-old talent? Mark recently finished recording his first Christmas CD, a collaborative effort between Mark and Küpaoa, the husband-and-wife duo behind his record label, Hulu Küpuna Productions. The album is due to be released later this year and promises to be something different, says Mark. It will feature two or three traditional Christmas tunes with the remainder of the songs being original compositions. In 2016, Mark expects to return to the studio to record the third CD in his traditional Hawaiian “lei” series. After that, he hopes to explore new and different avenues, including writing more contemporary music, doing movie soundtracks, and, perhaps, performing on the East Coast and in Europe.